There is a view on Gellert thermal bath, and liberty Bridge,from the windows, in a Romantic atmosphere. - Fully equipped kitchen, ready to use. is the ideal for a couple, for business trip, for a family 3-4 persons. bath,museums and of course the Marketplace closeby. of Budapest, pedestrian zone,the best place where to stay in the city! 1. ARE BED LINEN AND TOWELS PROVIDED IN THE APARTMENT? 2. ARE THE PRICES PER PERSON OR PER APARTMENT? Prices shown are per apartment per night. 3. ARE THERE ANY TAXES? No. All taxes are already included in the price. The payment is normally 1 day deposit by Paypal or bank account. The remaining of the balance is payable on arrival in cash. 7. IS THERE AN EXTRA CHARGE FOR CLEANING? There is no extra charge for cleaning. The apartment will be clean before your arrival. apartment, but you can ask our cleaning service also! 8. WHERE WILL WE GET THE KEYS? arrival at the apartment. You will met there at a time specified by you! 9. WHAT TIME CAN WE ARRIVE / DEPART? problems!Of not, we have an hotel lobby, where to leave the luggage or wait. vacated to allow for cleaning. No fee due for early or late arrivals! 10. WHO WILL MEET US AT THE APARTMENT? (the owners) or our representative will meet you at the apartment. There are no extra charges for gas, electricity etc. 12. WHAT IS THE MINIMUM STAY? minimum stay of three nights normally. 13. HOW WILL WE MEET AT BUDAPEST? - You give us a time period when you arrive to the apartment, and we will wait you there at that time. We have a special parking place, for 5 euro per night. 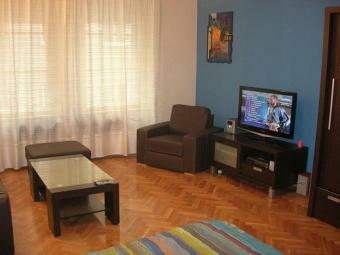 The parking are just close to all the flats, in Vaci utca! We also can host groups. the flats are in the main street of Budapest,Vaci utca, pedestrian zone, and the most silent and safety place in the town! Special discount for groups, and families and for reservations up to 8 nights!